Howard Marshall weaves the history, people and places of west Clare with tale and legend to provide the first written account of Garrett Barry, the blind piper of Inagh. Against a backdrop of continuing social strife, we are introduced to those who knew Barry and have carried his memory, ensuring that his rich contribution to local culture still resonates in the music of his homeland. 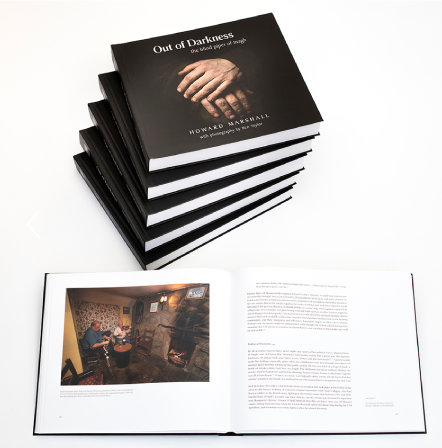 Beautifully illustrated with photography by Ben Taylor, Out of Darkness guides us through a world that has retained abiding traditions in poetry, folklore, music, dance and song. In nineteenth century rural Ireland, there were numerous itinerant musicians and many of them were blind. They moved in an agrarian society that, despite political upheaval and abject poverty, remained culturally rich. Born into the midst of the catastrophe of the Famine, Garrett Barry lost his sight through disease. However, blindness would serve to enhance both his memory and his hearing. Travelling his community of west Clare as it gradually recovered, he gathered much of the oral tradition that it still retained. He came to know intimately the land and its people, claiming that his music was 'not only for the feet but for the soul'. His commitment would drive his mission and his talents would ensure his reputation. Though Garrett Barry died before he could be recorded, the collective memory of his role in the culture of this district has survived. The legacy of his music and a wealth of stories concerning him have come down to us through the great impression that he made on many of his contemporaries. They, in turn, have passed on much of this oral heritage to later generations. There is a strong appeal to this poor man with a major handicap and yet with such cultural and sensory abilities. Despite the fact that, by nature of his condition, he remained illiterate, he had enormous allure and influence in his community. He remained dedicated to the people, at times without regard for his own welfare. As such, Barry's story is a fine example of the strength and generosity of the human spirit. to a publication in all my life." and a labour of love which required a scholarly and masterful approach. I cannot praise the whole finished product enough."